The awesome, stylish design of DHP's X Loft Bed will appeal to you and the high-quality of the product will impress you. Space-saving and convenient, this bunk bed provides a comfortable sleeping alternative with a large and useful work station, together in one. The black metal finish is secure and solid and will make an impactful design statement for your room. Accommodating any twin-size mattress, the loft bed has an easy-to-climb front ladder and full-length guardrails for security. 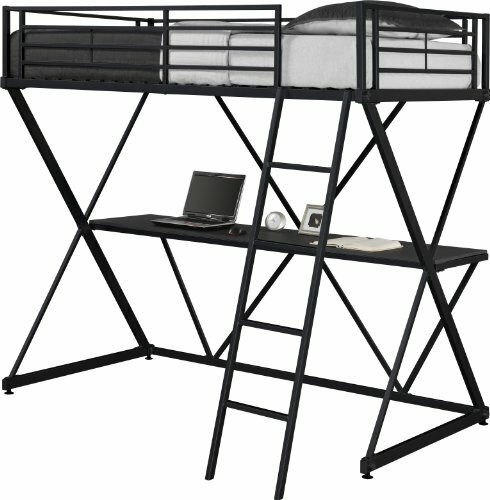 Once assembled, you will be in awe of how great DHP's X-Loft Bed in black looks.